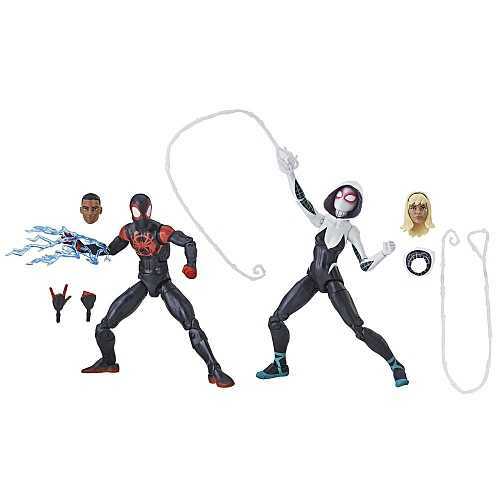 Produktinformationen "MARVEL LEGENDS SPIDER-MAN: INTO THE SPIDER-VERSE ACTIONFIGUR 2-PACK"
Carefully designed web-shooting technology lets Miles Morales and Gwen Stacy defend their city against enemies with web-slinging, wall-crawling style. With the Marvel Legends Series, both kid and adult Marvel fans can start a legendary collection of comic- and movie-inspired Marvel characters. These 6-inch Miles Morales and Spider-Gwen figures are highly articulated and feature movie-inspired design, making them another worthy addition to the Marvel Legends Series. Weiterführende Links zu "MARVEL LEGENDS SPIDER-MAN: INTO THE SPIDER-VERSE ACTIONFIGUR 2-PACK"
Kundenbewertungen für "MARVEL LEGENDS SPIDER-MAN: INTO THE SPIDER-VERSE ACTIONFIGUR 2-PACK"